Fourwhitepaws is honored to have received some awards and special recognition by faithful followers. Thanks everyone for your kindness and support! I like awards, they are the kind of thing that need to be shown off - so consider this page as my award and trophy case! 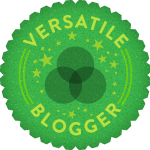 Sarah of Three Cats and a Girl presented Fourwhitepaws with the Versatile Blogger Award. What a cool looking award! I officially accepted the award on July 30, 2012, you can read it here. The Sunshine Award was presented by Random Felines. Nahum would sure love to sink his teeth into that flower! 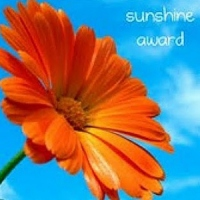 I officially accepted this bright award on July 30, 2012, you can read it here. 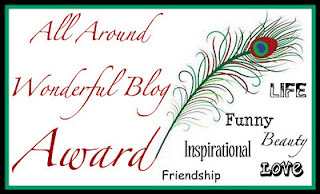 The All Around Wonderful Blog Award was presented on Valentines Day by Fur Everywhere. Wonderfulness Award: Graciously presented to Fourwhitepaws by House of Carnivores. I officially accepted the award on February 2, 2012, which can be experienced here. The Liebster Award was presented to Fourwhitepaws by Random Felines. This was our first award! My official acceptance speech is here.